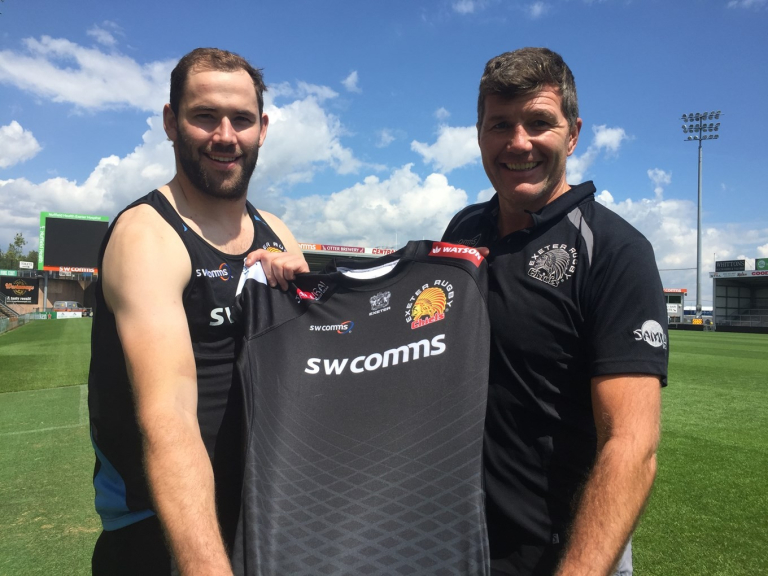 Exeter Chiefs have bolstered their squad ahead of the new 2017/18 season with the acquisition of powerful South African lock Wilhelm van der Sluys. The 25-year-old forward heads to Sandy Park on a one-year deal from Super Rugby side, the Kings, and becomes Rob Baxter's sixth new addition of the summer, joining the English champions along with James Freeman, Matt Kvesic, Tom O'Flaherty, Toby Salmon and Nic White. Born in Paarl, van der Sluys attended the local High School before moving onto the University of Stellenbosch, where he played for Maties Rugby Club. Also part of the Western Province, he made his debut during the 2012 Vodacom Cup, coming on as a replacement in their game against Pampas XV, before going on to win the Currie Cup in the same year, featuring in the same side as current Chiefs star Don Armand. Although rugby remained a key objective for van der Sluys in terms of his career, the youngster was keen to ensure he continued his education and it was not until last year that he really took up the sport on a full-time basis. Recruited by Worcester Warriors, his spell at Sixways proved somewhat short-lived, making just one appearance for the Midlanders in the Anglo-Welsh Cup before he enjoyed the odd loan game with both Rotherham Titans and London Scottish. A chance, however, to return home to South Africa with the Kings followed in March and the player quickly established himself in their ranks, featuring in Super Rugby alongside former Exeter player Chrysander Botha. It was his displays in that competition that brought him to the attentions of the Chiefs, who have moved swiftly to bolster their back five options following the summer departures of Geoff Parling and Damian Welch, as well as the ongoing rehabilitation of key forward, Dave Ewers. Commenting on his move to Devon, the 6ft 6in, 103kg forward, said: "I'm very excited to be here, I've only heard good things about the club and I cannot wait for the opportunity that lies in front of me. "I'm coming to a club that is full of confidence, especially after winning the Premiership last season, so I can't ask for a better club to join. I know it's going to be a new challenge for me, but it's one that I am really looking forward to." Van der Sluys says seeing a friendly face in the Exeter changing room already in the form of Armand was a welcome sight, but he says the vibe already in camp, plus chats with other South African players who have either played with or against the Chiefs merely helped to cement his decision to move to the Westcountry. "It always helps seeing a familiar face with a guy like Don Armand," he added. "He's done incredibly well for himself since moving here, but speaking to other players who are here in England, they say only good things about the club. They talk about them having good values, a great work ethic, so I'm so grateful to now be part of it." Van der Sluys arrives at the Chiefs having been part and parcel of a Kings side that caused it's fair share of upsets during the recent Super Rugby campaign. "That was my first real involvement of rugby at that top end level," said van der Sluys. "Up until that point I had played for Western Province and also for Mathies in the Varsity Cup, but we had a great season and caused a few upsets along the way. I'm grateful to the Kings for the opportunity they gave me as it's opened up this chance for me now with Exeter. "I've watched how Don has really taken his career on since coming to the Chiefs. He's a great example for someone like me of what you can aspire to. I know it's takes a lot of hard work to get to that level, but as I said I am looking forward to the challenge that lies ahead and hopefully I can add to the strength of the squad here."